John Brainard was named supply pastor of Living Word UB church in Columbus, Ohio. His first day will be August 13. He is licensed with the Southern Baptist Convention and is not yet ordained by the UB church. Dan Bentz, former associate pastor of Eden UB church (Mason, Mich.), will be assuming the role of senior pastor. Gary VanderVeen, pastor of Calvary UB church in Saginaw, Mich., will become senior pastor of Faith UB (Port Orange, Fla.) in mid-August. Nathan Baumann was hired on June 13 as the new assistant pastor for youth at Heart O’ the Lakes UB, Brooklyn, Mich. I am pleased to announce that the 2007 National Conference will be held May 31 – June 3 (Thursday through Sunday) at the Sawmill Creek Resort, in Huron, Ohio, on the shore of Lake Erie. The resort is about 45 minutes to an hour west of Cleveland. The speaker for Thursday and Friday evenings will be Pastor Brad Powell from Northridge Church. Registration information will be coming later, but I wanted you to get the dates on your calendar. This conference will be a great re-focusing time for our churches. Also at this National Conference, each church will be able to send voting lay delegates to represent their congregation to the highest governing body of the US National Conference. Plus, all conference ministers who are actively pastoring a United Brethren church or serving in an appointed or elected position are also voting members of the National Conference. You will receive further information regarding the registration for the National Conference in a few months. But just wanted to give everyone a “heads up” on the dates. Each church will be responsible for the expenses of its delegates (lay and pastors), so you will want to include this item in your 2007 Budget. 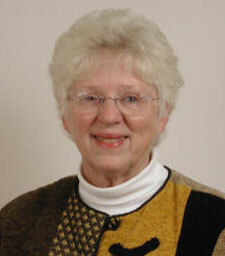 Dr. Patricia Zezula has decided to retire after 37 years on the Huntington University faculty. She began as an instructor in the Department of Physical Education in 1969 and moved up through the ranks, becoming a full professor in 1990. Zezula earned her doctorate in educational administration from Ball State University in Muncie, Ind. Upon her graduation from Huntington University in 1969, the University hired Zezula as an instructor, assistant athletic director and coach. At various times during her first 15 years on staff, Zezula assumed head-coaching responsibilities of every woman’s sport the college offered. In 1982, she was promoted to athletic director, giving her the distinction of becoming the first female intercollegiate athletic director in Indiana. “It has been a privilege to work at Huntington, and I look forward to continue teaching on a part- time basis,” says Dr. Zezula. 26 Jul Is Your Church an Island? I had breakfast the other day with three UB pastors. One was pastoring a large church that is well established, and the other two were pastoring smaller congregations that were planted 5 – 8 years ago. All three pastors live within about a half-hour of each other. Another thing you need to know about these churches–they all want to bless people beyond the four walls of the buildings they meet in. These leaders honestly want to move their congregations to a greater level of engagement in a lost and dying world, both around the corner and in the far corners of the world. And, to their credit, they are taking deliberate steps in that direction. And that is a very different question. We talk a lot about the “Body of Christ” at the local church level. Most of us would agree that helping the members of our congregations discover and engage their giftedness and calling is one of the most important things we do. I remember my days as a church planter and senior pastor. For me the concept of an interdependent body–with each member doing what the Holy Spirit had equipped them to do – was a matter of survival. There was no large, red “S” imprinted on my chest. After a short period of time I learned that I desperately needed others to step forward and live out their giftedness if our church was going to be healthy and fruitful. Could these same principles be true on a regional level? Is it possible that our local churches were meant to function with other local churches in an interdependent way as we focus on the unfinished mission of making disciples? Those of you who have spent a lot of time in the book of Acts might have some good insights on this. How many churches were there in Corinth? Were there many churches, or one church of Corinth with many members spread over the region? And if there is only one church of Detroit, or Fort Wayne, or Lancaster, then how do we function together to accomplish the mission that Christ initiated and promised to fulfill? Can we plant more churches that make disciples of more people by taking joint ownership of our region and intentionally working together for something far greater than the “success” of our own, individual churches? I would love to get some feedback on this! On April 30, 1989, Rev. Robert Pelley didn’t show up for church. Eventually, two men went over to the parsonage, where a grisly scene awaited them. Robert Pelley (38), wife Dawn (32), and two of Dawn’s daughters from a previous marriage, Janel (8) and Jolene (6), were found dead. They have been killed with a shotgun. Jeff’s sister Jacqueline and stepsister Jessica were not home at the time. Seventeen years later, Jeff Pelley was convicted of the murders. The case was reopened four years ago, and after a six-day trial which included nearly 40 witnesses, jurors returned a guilty verdict after deliberating for 34 hours. Jeff, the son of Robert Pelley, is now 34 and has been living in Florida with his wife. The evidence was mostly circumstantial. No murder weapon has been found, and no fingerprints linked Pelley to the crime itself. Rather, the prosecution relied on a carefully constructed timelime which put Jeff Pelley at the parsonage during a particular 20 minute period. After murdering his parents and stepsisters, the prosecution contended, Pelley went to high school prom with his girlfriend. The motive, argued the prosecution, concerned arguments with his father over weekend restrictions which would allow Jeff to go to the prom, but to no other activities. Police located him at the Great America theme part with friends the day after the murders. After spending a few minutes with his wife and sister, Jacqueline, Pelley was led away in handcuffs. Sentencing is set for September 15. Jana Hoobler, missionary in Macau, sent the following updates on July 22. The street carnival was a big success. I was especially blessed to see most of the people who regularly attend Living Stone Church jump in and help in one way or another. This was the first event in which we’ve all served the neighborhood together, and I loved seeing that happen. Pray for wisdom and direction as Michael Chan and I consider how to best involve more Living Stone attenders in children’s ministry on an ongoing basis. We had record numbers at Vacation Bible School, thanks to having a record number of adults willing to help. Over 60 children attended, and 12 children prayed to believe in Jesus for the first time. Pray for Michael and Sally, my Chinese co-workers, as they follow-up with these children. I was extra-excited about the parents’ program on the last night: 45 children came, 44 family members came, and our 18 adult helpers were all there. That’s over 100 people. Unless you’ve seen the size of our main meeting room (which is only around 800 square feet), you can’t quite appreciate the miracle it was to have that many people in our church at one time without anyone getting trampled (although a few of us almost passed out from the heat!). One of my desires this year is to find ways to connect the families of our children with Living Stone Church. Most of the parents who came to the program have a very positive impression of Living Stone. Pray for wisdom as we look for ways to keep in touch with these parents, serve them, and draw them into the church. This week Macau hosted the CCCOWE conference, a meeting of about 2400 delegates from Chinese churches around the world. This was a huge undertaking for the churches here, and I think they did a great job. Of around 3000 Christians in Macau, about 600 of them volunteered at the conference in one role or another. When they recognized all the volunteers at the closing service, I sat there feeling like a proud mother about poppin’ my buttons. (This missionary thing does funny things to your heart). Pray that this experience will lead to greater unity among the churches in Macau in reaching this city for Christ. On August 5 we’ll start Kids’ Klub again on Saturdays. Pray for direction as I plan for Kids’ Klub. Also pray that children who accepted Christ this summer will come and join Kids’ Klub so that we can continue to help them grow in their faith. Having Beth Nelson here focused on children’s ministry for the summer has also been a boost. Marilyn Reeck with her four daughters and granddaughter. L-r: Chrysti (Reeck) Andino and daughter, Amanda, Elisa, Marilyn, and Teresa. Roger and Marilyn Reeck are endorsed UB missionaries serving with Wycliffe in La Ceiba, Honduras. The entire Reeck family was present for the May 10 graduation of Elisa, the youngest of the four Reeck children. She, like her three older sisters, graduated from Pensacola Christian College in Florida. A Honduran flag was placed on the platform, alongside other flags, to represent Elisa. After 700 graduates received their diplomas, the culminating Presidential Citation of Merit was announced. This award is given to one male and one female student for their Christian leadership and for exemplifying the ideals of the college. They were all excited when Elisa’s name was called out to receive the award. After seven weeks in the States, Roger and Marilyn were headed back to Honduras when a major delay occurred. Marilyn was turned back at the airport because her passport expired in one month. A new law declares that passports must be valid for at least three months prior to entry into any Central American country. Marilyn sent off to Canada for a new passport and was able to travel three weeks later–just in time for a trip to Nicaragua. In the meantime, she waited in San Antonio, Texas, while Roger continued to Honduras. Daughter Chrysti, along with two little ones, live in San Antonio. Gary Dilley, director of Global Ministries, is currently on an extended trip through Asia. He will be spending time visiting United Brethren ministries in Hong Kong, Macau, Thailand, the Philippines, and India. He and his wife, Rhonda, left the US on July 19 and will return August 14. During a recent trip to Sierra Leone, Rev. Joe Abu delivered four lawnmowers to the Centennial Secondary School in Mattru. The mowers were purchased with donations from former Centennial students now living in North American and Europe. Joe Abu is pastor of Mount Zion United African Church, a UB church in Philadelphia, Pa.
Rev. Bob Conway, a retired United Brethren minister, has published a book called Decoding Daniel, a commentary on the book of Daniel. If you are interesting in obtaining a copy, you can order one for $15 (which includes tax and postage), from: Robert Conway, 597 Houser Road, Fayetteville, PA 17222. After 17 years as pastor of the Orrstown (Pa.) UB church, Conway retired to write, speak, and teach. He has taught biblical studies to laypersons and pastors for continuing education units for the past ten years. Each course lasts ten hours, and is usually taught over five evenings or two days. For information, contact Rev. Conway at the above address.